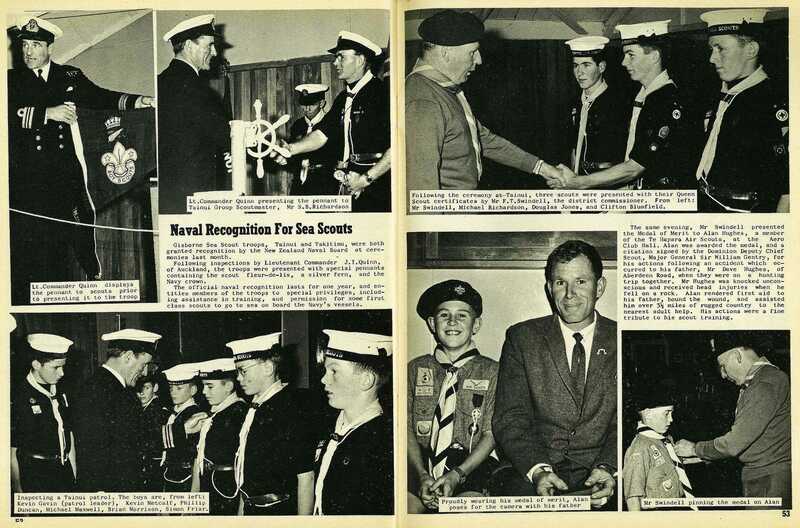 Gisborne Sea Scout troops, Tainui and Takitimu, were both granted recognition by the New Zealand Naval Board at ceremonies last month. 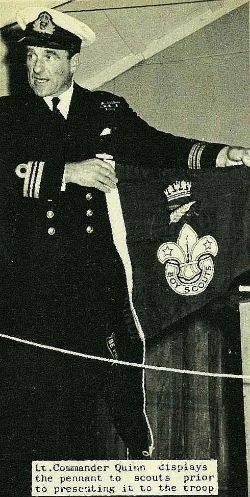 Following inspections by Lieutenant Commander J. I. Quinn, of Auckland, the troops were presented with special pennants containing the scout fleur-de-lis, a silver fern, and the Navy crown. 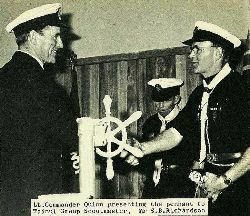 The official naval recognition lasts for one year, and entitles members of the troops to special privileges, including assistance in training, and permission for some first class scouts to go to sea on board the Navy's vessels. Inspecting a Tainui patrol. 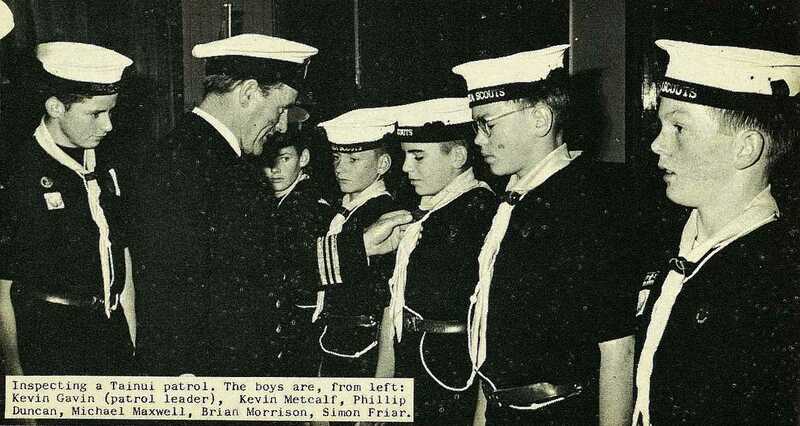 The boys are, from left: Kevin Gavin (patrol leader), Kevin Metcalf, Phillip Duncan, Michael Maxwell, Brian Morrison, Simon Friar. 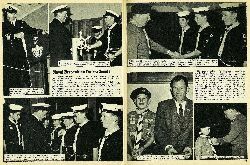 The same evening, Mr Swindell presented the Medal of Merit to Alan Hughes, a member of the Te Hapara Air Scouts, at the Aero Club Hall. 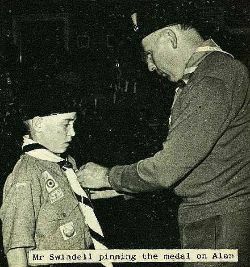 Alan was awarded the medal, and a citation signed by the Dominion Deputy Chief Scout, Major General Sir William Gentry, for his actions following an accident which occurred to his father, Mr Dave Hughes, of Aberdeen Road, when they were on a hunting trip together. Mr Hughes was knocked unconscious and received head injuries when he fell on a rock. Alan rendered first aid to his father, bound the wound, and assisted him over 3 1/2 miles of rugged country to the nearest adult help. 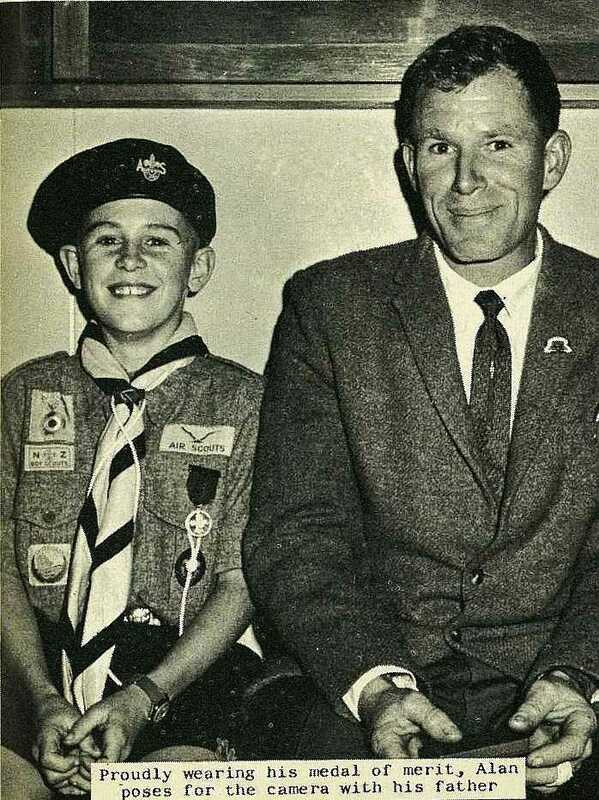 His actions were a fine tribute to his scout training. 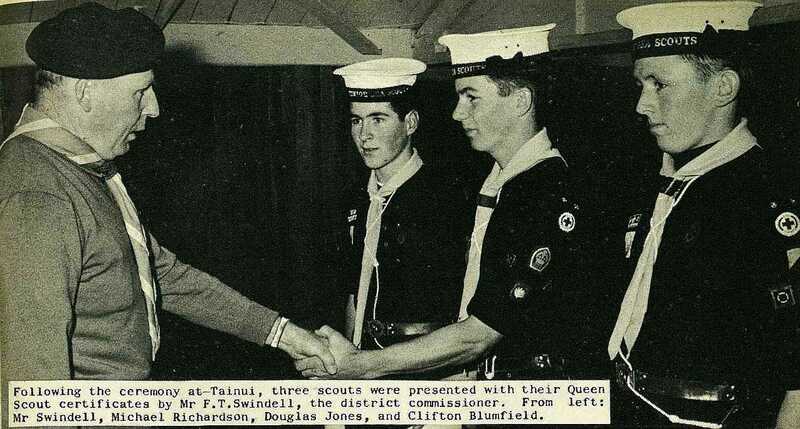 Following the ceremony at Tainui, three scouts were presented with their Queen Scout certificates by Mr F. T. Swindell, the district commissioner. From left: Mr Swindell, Michael Richardson, Douglas Jones, and Clifton Blumfield.